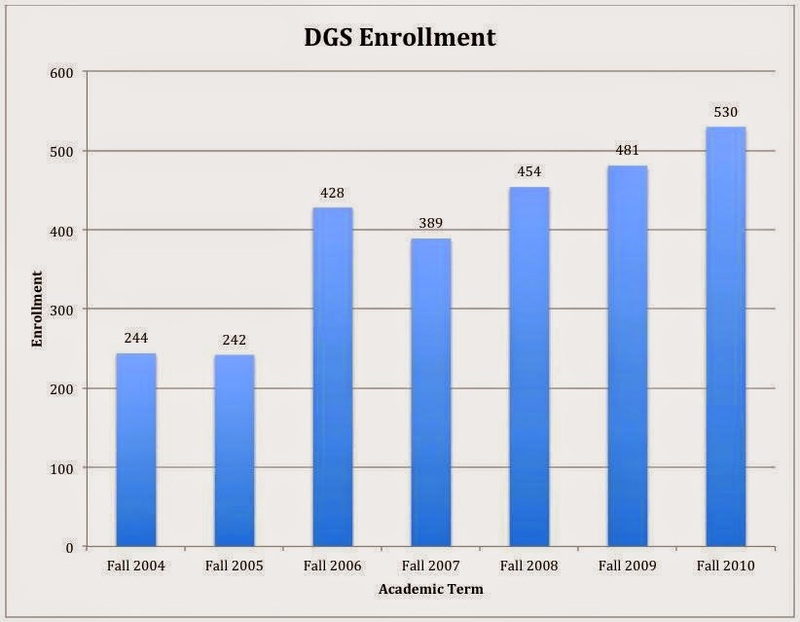 Over this period of time the DGS enrollment grew by 286 students corresponding to an amazing growth of 117%! 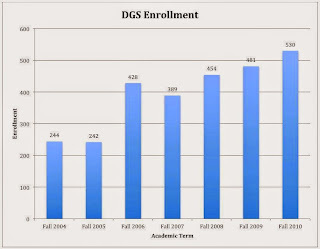 The DGS program was designed to allow admission of students who did not meet the normal admission requirements to St. Cloud State University (SCSU). In essence, for many years the DGS program was a way that SCSU functioned as a “community college,” at least until St. Cloud Technical College was renamed St. Cloud Technical and Community College. 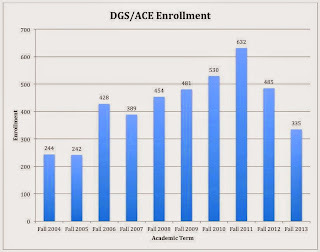 In March 2011, after the Enrollment Management Committee had projected a decline in enrollment for the 2011-12 academic year, which included a target of 500-530 DGS students to be admitted. Provost Devinder Malhotra increased the target for the DGS Program’s enrollment to 850 students. There was no prior discussion at Meet and Confer and there was no announcement; it was simply done with the stroke of a pen. 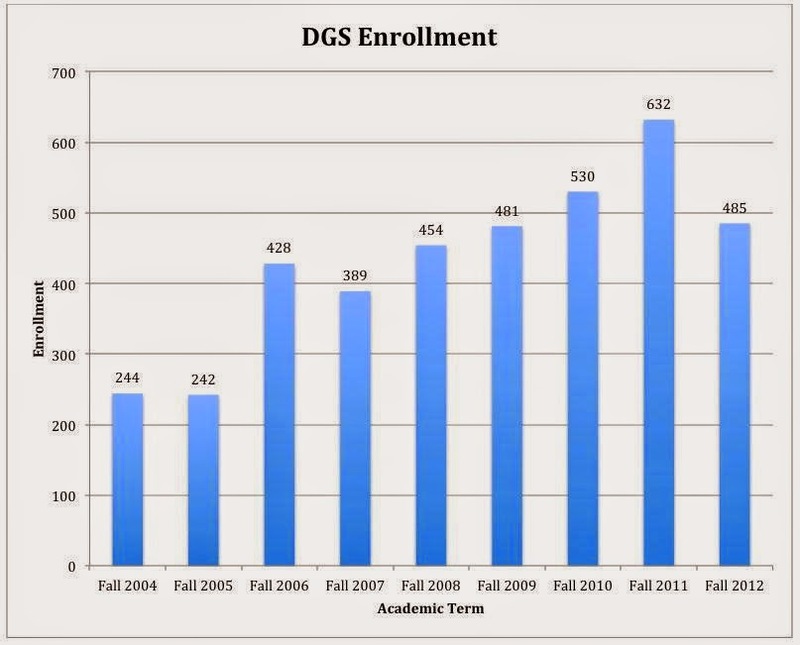 Presumably, the increase in the size of the DGS program was to help offset the projected enrollment decline. However, this detail was never discussed at Meet and Confer. 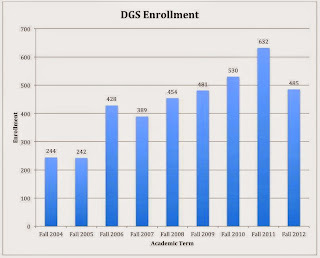 In Fall 2011, the number of DGS students increased above its original goal by 102 students to 632 students. Because the decision to ‘open the flood gates’ to the DGS program was made so late in the recruiting cycle for students, it was not possible to reach the 850 students Provost Malhotra desired. 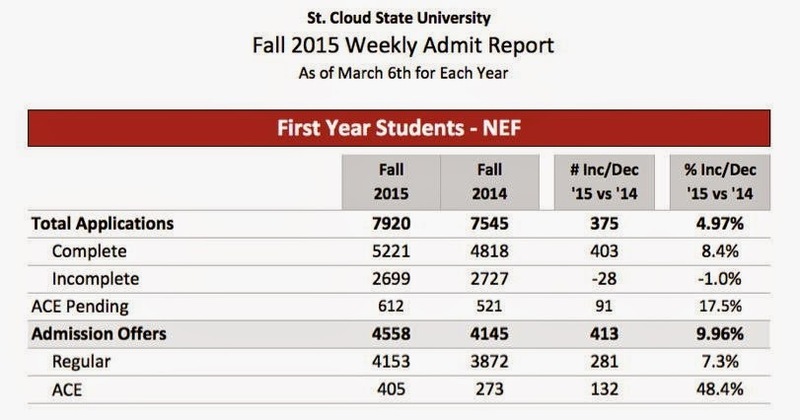 However, a one-year increase of 102 students is still pretty impressive! Once again, there was no discussion about changing the size of what had been known as the DGS program—there was simply a pronouncement at Meet and Confer. 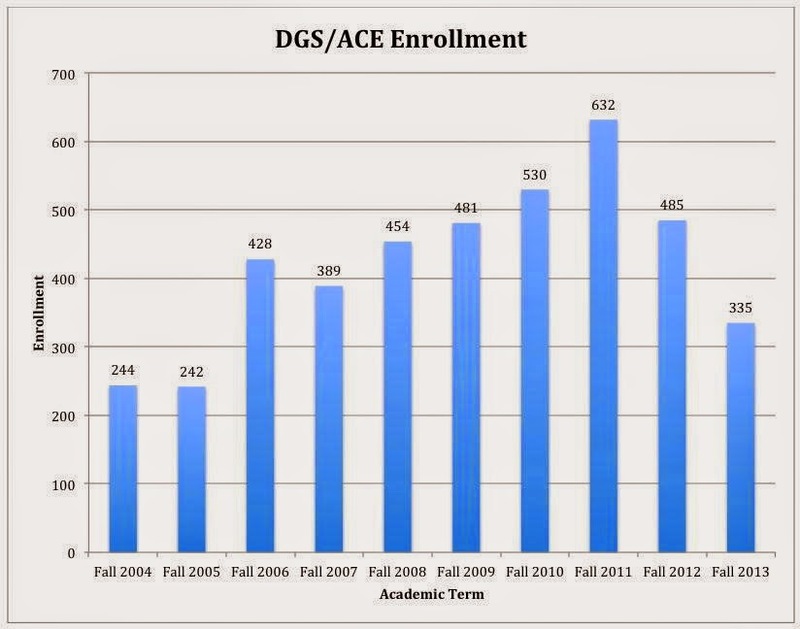 Looking at the rate of decline from Fall 2011 to Fall 2012, and then from Fall 2012 to Fall 2013, it is hard to believe that the enrollment decline in the DGS (now ACE) program was actually planned. Looking at the data, it seems just as likely that it was simply a continuation of the prior year’s trend. Looking at the numbers, you can see some ‘good news.’ The total number of applications is up, the number of complete applications is up, the number of incomplete applications is down (a good thing), and the number of admission offers is up for both regular and ACE first year students. What stands out is the enormous increase in the ACE admission offers! A one-year increase of 48.4% is astounding! 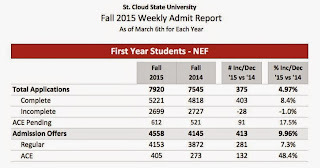 In Fall 2014, there were 285 ACE students. Now, there are 405 offers of admission, which is 48.4% larger than the prior year on the same date. As a result, it certainly looks like the size of the ACE program is targeted to increase—substantially! It is important to recognize that admission offers do not mean that a student will enroll so the number of students enrolling will be less. However, the numbers in a year-to-date comparison are clearly increasing. Is this the result of an intentional decision to grow the ACE program? Just 18 months earlier (remember the September 5th Meet and Confer quote), the administration claimed that the ACE program was being reduced because these students were such a high risk to fail that admitting them bordered on the exploitative. It almost seemed as if the university was claiming the moral high ground by not accepting students who were destined to fail. Now it seems that the enrollment of ACE students is ramping up significantly. What has changed? As soon as you hear the statement about the administration wanting to be “open and transparent” you simply know that whatever follows is less than truthful. “Open and transparent”, if it is ever going to be more than simply a group of words, needs to become the modus operandi. In this way, the words themselves become superfluous because the actions of being open and transparent have become a well-established characteristic.